If you’re searching for a new project to tackle, look no further. Fairy gardens seem to be all the rage, so I figured I would give it a shot. Continue to read for ways to decorate your fairy garden. What exactly are you hoping to accomplish? Is this a project for yourself? Are you crafting with children? Or do you need a little magic to add to your living arrangement? Whatever the case may be, keep in mind the purpose for a successful end result. 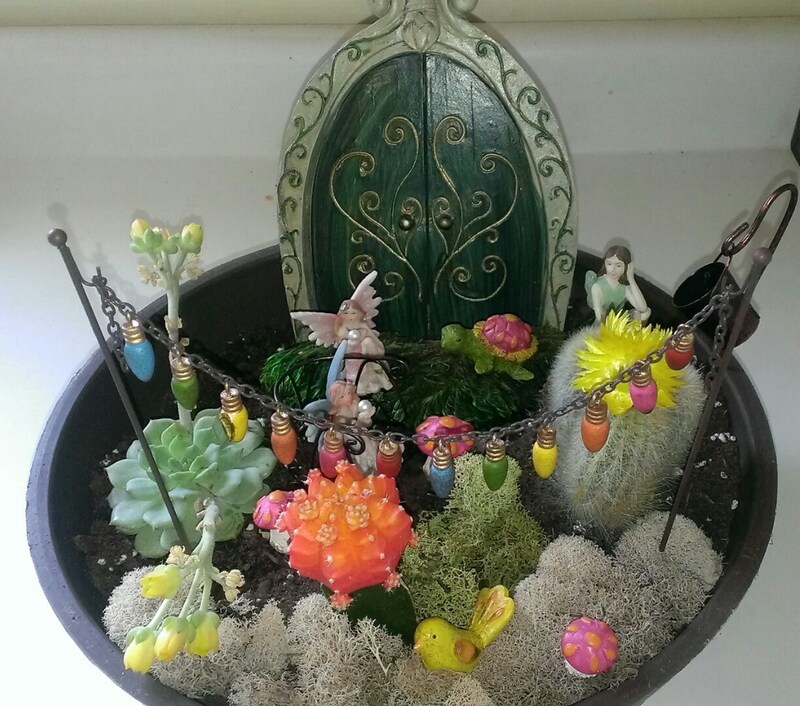 I personally chose to create a fairy garden after learning about them from my friend Caitlin, plus the work I discovered on Pinterest was enough to inspire me. Most gardens I’ve researched tend to be outside, but the location is up to you. Center of Symmetry in Nashville has a fairy door next to the main entrance, welcoming the good vibes to their establishment. Since we might move this summer, I decided a container garden would best suit our needs. The container rests on our porch with plenty of sunlight available to the plants. A few crafty individuals on Pinterest actually bolted their fairy doors into trees with the garden accessories leading to the entrance. I’ve also noticed indoor fairy gardens in windows that are equally as cute. With a container garden, you have the luxury of bringing the pot in during cold weather and placing the pot on the porch on warmer days. Now it’s time to pick out the plants. Since I’m an advocate of the succulent varieties, I opted for Home Depot’s cheap cactus plants. One of them is fuzzy, resembling a miniature Golden Barrel Cactus, while the other one is called a Grafted Cactus topped with a beautiful, glowing yellow and pink addition. The Echeveria remains my favorite, with tiny yellow blooms repelling in opposite directions. As you can see, I aimed for a “South West” Fairy Garden. If you decide to stick with Cacti, remember to choose the correct dirt, as the plants tend to thrive in loose soil. For the sake of filling the container, I used organic potting soil but covered the top with cactus soil. Miracle-Gro also provides cactus food for purchase which is helpful. The last step gives you room to get creative. I added 3 fairies to my garden, and one of the ladies has a chair to sit in. I added festive lights to give the container some color and filled in bare spots with moss purchased from Martin’s Home and Garden located in Murfreesboro, Tennessee. The cashier warned me of the risks that came with this project: Cacti doesn’t require much water, while moss thrives in moist conditions. Not a problem, though, the moss is easy to remove and soak while the cactus plants only require watering about once a week. Since I’m a fan of turtles and birds (like most hipsters), I added trinkets to the garden, so the fairies aren’t alone. I also added Selenite for angelic guidance, adding a deep sense of peace to the area. The fairy door rests towards the back of the bowl, but I might move it to the front soon. There’s a pale for the women to collect rain water as needed plus mushrooms for a truly magical atmosphere. I felt relief and solitude working on this project. Gardening has become a favorite hobby of mine, and this endeavor gave me something new to try. I plan to add to the garden in the upcoming weeks; a table and another chair ought to complete the mission. If anyone has photos of their fairy garden, please share 🙂 Or, if you chose to craft a fairy garden for different reasons, I would love to hear your story. Next Next post: Full Speed Ahead! I have never seen a fairy garden but it is cute. I read a lot of books about the fae. Many thanks for this article. Found it educative. Awesome! Keep me updated if you choose to garden this year! I see a new project for my granddaughter coming up! How beautiful, would love a fairy garden! It was a fun project 🙂 I need to catch up on your site, is your hand still injured? Or are you back in the kitchen full swing? Hey! Thanks for the feedback, Selenite was one of the first “rocks” I ever puchased haha it’s technically Skyscraper Selenite. And I totally agree, feel like a cute alter on the porch.